My family and I got to go and stay for a week with my BFF Erin and her family. 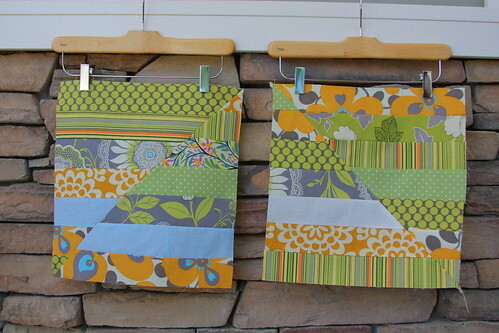 We did lots of fun things, among them was sewing some Quilting Bee blocks together. These blocks are for the Cottage Quilting Bee. July's block for Adina. My block is on the right and Erin's block is on the left. 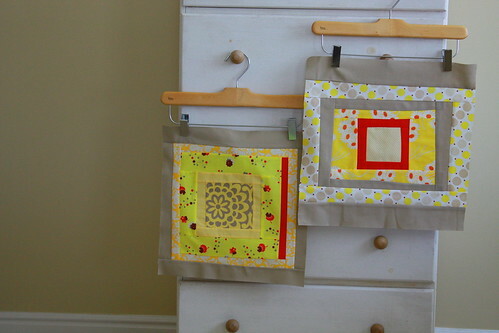 These blocks were also for the Cottage Quilting Bee. July we had 2 blocks to make and this yellow and gray block is for Tina. My block is on the right and Erin's block is on the left. We spent a whole week up with Erin's family and during that week was Erin's birthday. I was sneaky and called her Mom and asked her to get the measurements of Erin's sewing machine so that I could make her a cover. I used my charm pack from the Fresh line and some ric-rac to make her the cover. Her sewing machine has the large tray on the bottom so there was no way to make the cover tighter. This way the cover is really easy to take on and off. It is not a great picture, I will try to get Erin to take a better one soon to really show you the cover up close. It was so nice to be able to hang out and sew together. Of course one day we went fabric shopping for hours and I came away with a HUGE amount of fabric. I had not bought fabric for 5 months or more since I first got sick, so it felt great! I mainly was buying fabric for the girl that I am having to make her bedding. I thought I wanted to use Mezzanine by Patty Young for Micheal Miller fabrics, but once we went shopping I found other fabrics. I gave my mom this stripe print and a Micheal Miller white with aqua dots, so she could make the bumper pads and I forgot to take a picture of them before I gave them to her. 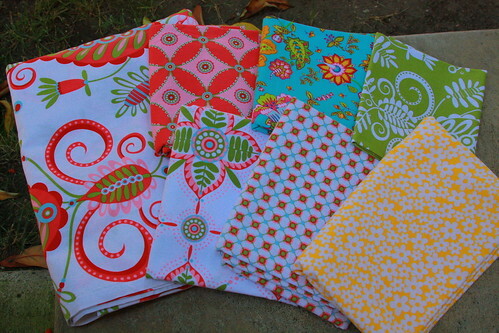 Most of these fabrics are from Pillow and Maxfield by Michael Miller, Whimsy Fabric Set in Pink. I need to find another yellow to go with this set. Of course I had to buy other fabrics that I really do not need, but it was hard to stop once I got going. I am sure all of you understand. How fun to have someone to fabric shop with! I love the yellow flowers, and I'm scared of yellow. love those blocks! 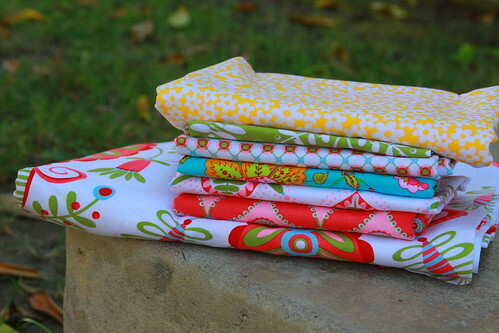 you picked up soem realyl lovely fabrics too! i see many i *love* in that last photo!! Oh how I wish one of my BFF's sewed! Sounds like you had fun. 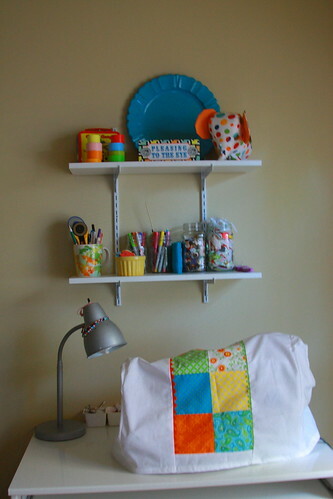 Love the sewing machine cover and your blocks you made..smart girl! I somehow stumbled upon your blog. 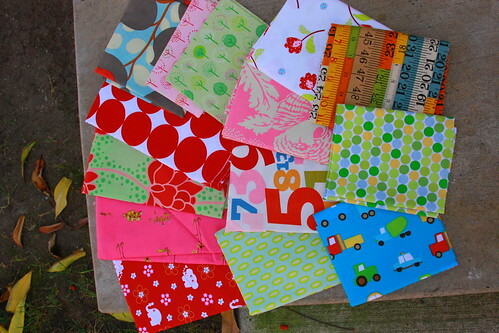 And I am wondering about when you find some fun, cute fabrics....how do you decide on how much to get? 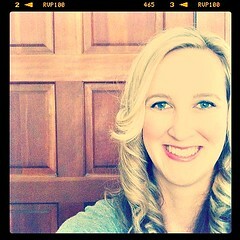 Love you blog. 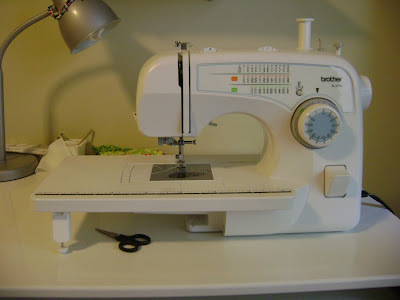 it's so great to have a friend who sews too! love your fabrics...i've been on a bit of a buying binge lately. i need to get under control!